St. Mark is a member of the St. Louis Association and the Mid-Missouri South Conference, The United Church of Christ is a denomination that supports many efforts around the globe. Our Church’s Wider Mission (OCWM) funds the work we do in the national and global church. OCWM funds are used in many ways, from helping after hurricanes and tsunamis to providing programs to enhance education, improve water, provide medical work and training, as well as many other programs. For more information about the UCC and its work both locally and abroad, visit www.ucc.org. 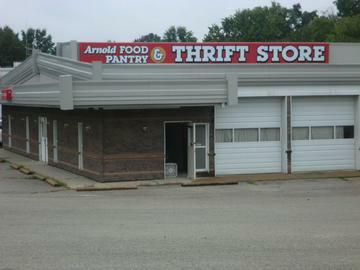 The Arnold Food Pantry does more than just provide supplemental food to families and individuals experiencing hunger and poverty in our community. The Pantry also assists neighbors in need with household necessities, toiletries and pet food. St. Mark UCC is a supporter of the Food Pantry in many ways. We have members who serve on the Food Pantry Board of Directors and we have members who volunteer at the Pantry in various ways. Additionally we collect money donations monthly as well as food and toiletries several times during the year. Many of our members also help with accepting donations during the Boy Scouts canned food drive. Lydia’s House is the only transitional housing program in Eastern Missouri that is specifically for battered and abused women and their children. They have 36 confidentially located, fully furnished apartments where their families can find refuge, safety and support. St. Mark offers financial support throughout the year with special monetary donation collections. Additionally we prepare a meal several times a year that is taken to Lydia’s House to feed those who are housed there before they make the transition to apartment living. 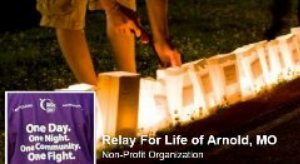 Relay For Life is a fundraising event for the American Cancer Society in which communities across the globe come together to honor cancer survivors, remember loved ones who have lost their battle to cancer, and fight back against a disease that has already taken too much. 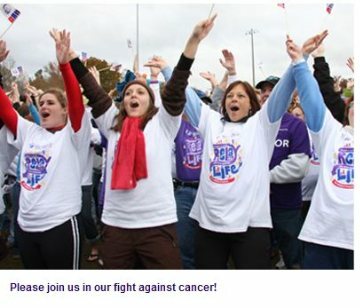 St. Mark has been active in Relay For Life for many years now. Our first active participation began with having a team of St. Mark members join together on the night of the event and participate in its activities and ceremonies. Our efforts have grown over the 8 or 9 years of participation in that we actively raise money through car washes, garage sales, etc. In 2013 we were the largest fundraising team of all teams who participated! Additionally we have several members who are on the planning committee for the Arnold event as well as those who serve as Chairpersons of the committee. The Boy Scouts and Girl Scouts are two of the nation’s largest and most prominent values-based youth development organizations. They provide a program for young people that builds character, courage and confidence and trains them in the responsibilities of participating citizenship. Over the years St. Mark has been a place where Boy Scout and Girl Scout troops can hold their meetings. We also sponsor one Boy Scout troop as well as a Venture Crew of young adults (boys and girls). Venturing provides positive experiences to help young people mature and to prepare them to become responsible and caring adults. The scouting troops are eager to work with us at St. Mark in any way they can. At the same time, St. Mark has called on them for help with various projects. Our mutual respect for one another is constantly evident.